Last time I hope: There has been a change to Thursday’s triangular times at Cannon Falls BACK to the original schedule. I got another email before practice tonight stating that the times were back to what I had originally wrote here and stated. Sorry for the confusion-I’m trying to keep up too! I deleted the previous inaccurate post. Goodhue will wrestle Lake City in the second dual and Cannon Falls in the third dual of the evening. Also, Cannon Falls will be having a “Take Down Cancer” night with a few events to help raise funds/awareness for the Randy Shaver Cancer and Community Fund. The Varsity team is coming off of a strong weekend at the Robbinsdale Cooper Duals. The Wildcats went 3-0 and put over 50+ points in all 3 duals, defeating the host team 59-9, Mankato West 57-18, and Section 1A opponent FCLMC (Fillmore Central-Lanesboro-Mabel-Canton) 54-29. The team currently carries a 10-7 dual record. 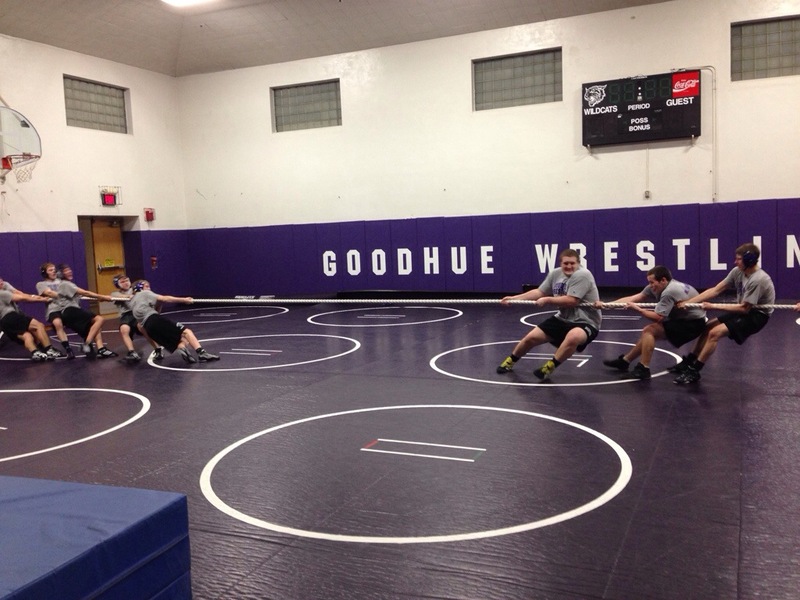 The final week is another busy week for the Goodhue Wrestling team. Thursday the team travels to a triangular at Cannon Falls with Lake City. Saturday the squads split up, with the Varsity traveling to the Robbinsdale Armstrong Duals, and the JV competing in the SE MN JV Duals held in Mazeppa. The JV Duals hasn’t determined the format, so it’s unclear right now about all dual times and such. However, the expectation is to get 3-4 duals I believe. Next week will be even busier, with a dual (possibly a triangular) in Byron Thursday, then hosting a make-up triangular Friday night, and then the HVL JV Tourney on Saturday. *Note: Tell your parents/fans there is limited parking. They can park on the back side of school (S-SE side of building) on the playground area. They will have to walk around school to the open doors. Tonight! Goodhue hosts Z-M for Parents + Senior Night! Brave the cold and come into a warm gym as the Goodhue Wrestlers host the Z-M Cougars tonight! 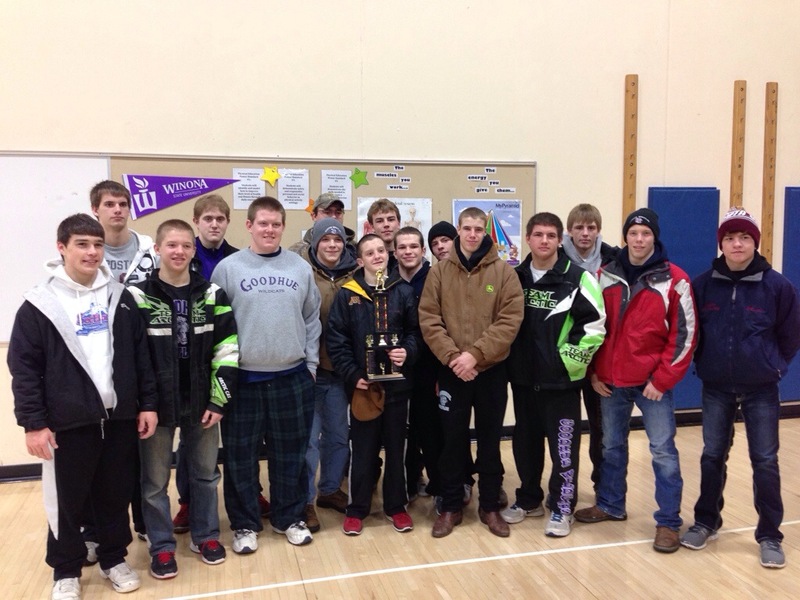 Goodhue will celebrate their senior wrestlers and statisticians and their parents before the Varsity dual. JV starts at 6:00, and then the ceremony followed up by the Varsity dual at approximately 7:15 p.m. The 9-12 squad will practice Friday morning in preparation for the Robbinsdale Cooper Duals on Saturday. That event starts wrestling at 9:30 a.m., and the wrestlers have to leave at 6:00 a.m. to get to weigh-ins. Goodhue went 2-1 at their first appearance in the Rogers Royal Rumble Duals Tournament. After a flat opener against Blaine in the first round, the Wildcats woke up to beat Mille Lacs/Onamia 53-15 and then St. Cloud Tech 45-30. Here is the team pictured with their Consolation Champion trophy. This Friday (January 24th), the Varsity and B Squad will practice at 6:30 a.m. In the afternoon, the Jr. High will travel to Ellsworth’s annual middle school tournament. The bus will leave at 3:00 from Goodhue. Wrestling is to begin at approximately 4:30 p.m. with 5-man round robin brackets. 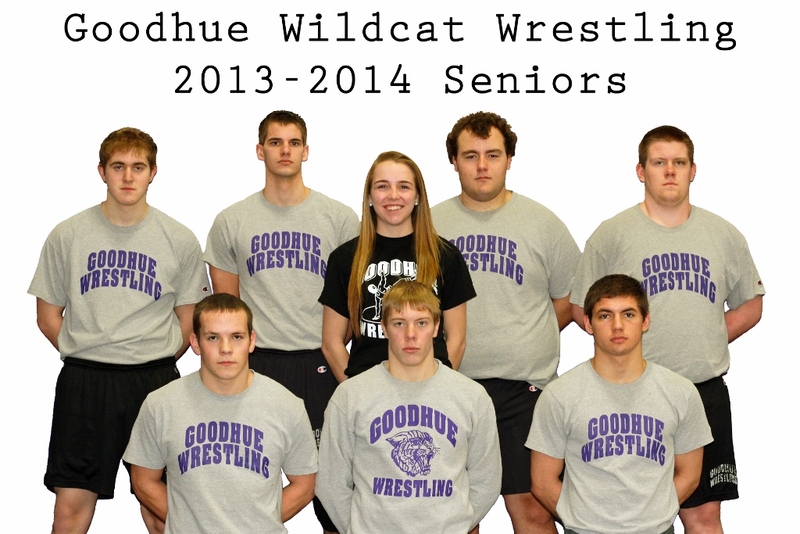 Goodhue Wrestling will not be hosting the HVL triangular tonight (1/16/14) as planned. While Goodhue remains open, both Triton and Pine Island closed early today due to the weather, and consequently the matches are off. The triangular has been rescheduled to February 7th. This is a Friday night, and we are scheduled to wrestle the night before in Byron, so we will have a 1# weight allowance as well that night. Thursday night brings in the second home event of the season for the team. We will host HVL Conference opponents Pine Island and Triton. Saturday the Junior High squad has the weekend off while JV and the Varsity travel to the Rogers Royal Rumble Duals. We will wrestle 3 duals in the 8 team bracket, with an anticipated start time of 10:00 a.m. The bus departure is set for 6:30 a.m. Here the boys take each other on in a end-of-practice game of tug of war. Coach Wingert couldn’t resist getting in on the action!